Pitch Perfect is a utility app for the musically inclined. 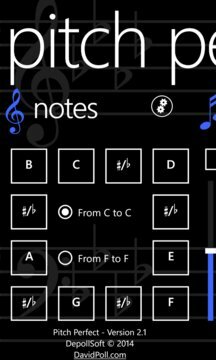 At its core, it’s a digital pitch pipe, allowing musicians to take an initial pitch before beginning or rehearsing a song. 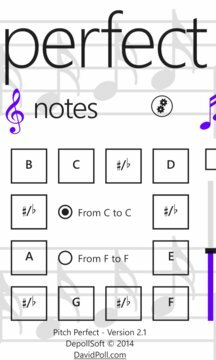 If you’re the type of person who struggles to match a key signature to the name of a key, the app provides visual aids to make it as easy as matching what you see on your sheet music with the image on your screen. For singers who keep a list of songs and their keys, Pitch Perfect makes it easy! Just hold down the button to play the note! Note: Pitch Perfect makes no effort to synthesize a natural sound -- instead, it generates a plain old sine wave at the appropriate frequency. The goal of the app is to provide quick, easy access to a note when you need it.